Imagine all the top musical groups of the year getting together on New Year’s Eve, not for awards, but to perform their top hit of the year. This happens in Japan every year. It’s called NHK Kouhaku Uta Gassen (NHK’s Red & White Song Battle). It’s one of the highest rated television shows each year and has been a tradition for over 60 years. Many of the top acts of the year, as well as popular acts (both Pop and Enka) of yesteryear are separated into two groups, the White group (the men) and the Red group (the women). They all perform and it’s determined which group gave the best overall performance. For many years it was considered that a group had ‘made it’ when they were invited to appear on Kouhaku Uta Gassen. Dreams Come True ‘made it’ in 1990. ^_^ Since Miwa is the frontwoman for the group, DCT is always placed in the Red group. 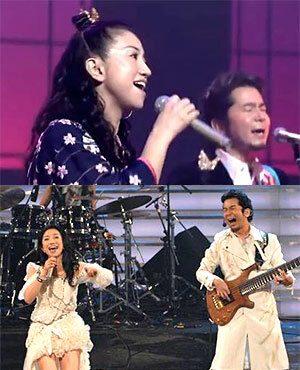 DCT has gone on to be one top pop/rock groups, in number of appearances, in Kouhaku history! 44th Kouhaku Uta Gassen (1993): go for it! 48th Kouhaku Uta Gassen (1997): PEACE!